On 8 January, Dive Ninjas kicked off 2019 in style with our first expedition of the year – heading to the Revillagigedo Archipelago with Dr Mauricio Hoyos Padilla and Pelagios Kankujá for a Ninja style shark research expedition! Want to know what we got up to? Here’s Sze Wei’s trip report! 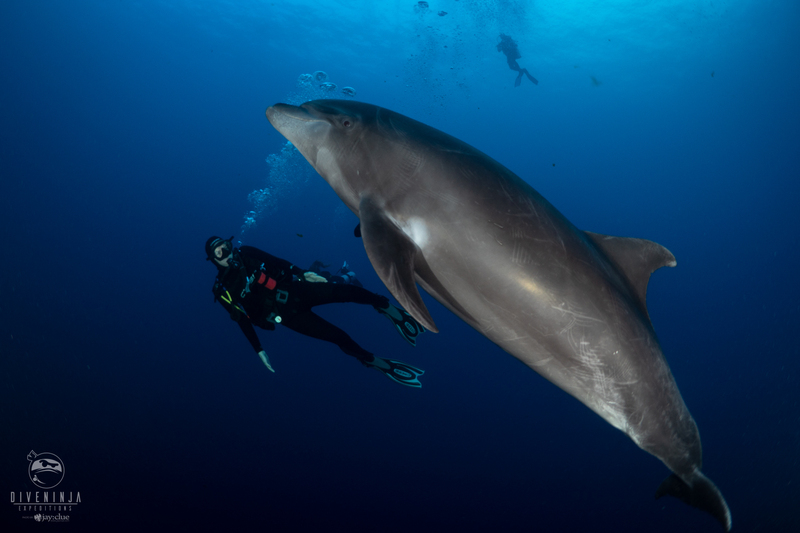 I’ve been to the Revillagigedo’s (my favourite tongue twister of a dive spot!) twice prior to this trip, and it has never ever disappointed, with awesome pelagic encounters and surprises each day. This time however, the trip was extra special as we were joined by one of the worlds foremost experts in sharks, Dr Mauricio Hoyos Padilla, as well as PhD candidate Pete Rodrigues Arana of Pelagios Kankujá – who led the Ninja Citizen Science Shark Expedition. Throughout the week, we got to help them with their hands on shark research in the water, as well as learning a lot about sharks and the ongoing research and issues in this area. 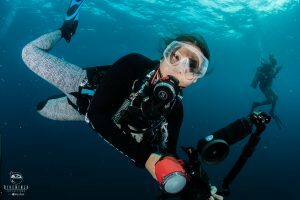 It felt awesome to be diving and learning with a purpose! There was a real buzz as the 17 shark loving guests started to assemble on the Quino El Guardian on the evening of 8 Jan – with everyone excited to meet Mauricio and Pete and get the trip started! The sharks are waiting!! The totally awesome crew of the Quino were on hand to get everyone settled in and comfortable. As the sun started to set, we sat down to the first of many delicious dinners together, and the Quino set sail for the 30 hour crossing to the archipelago. The next day was crossing day – with lots of relaxation, as well as dive briefings from the crew. But this is the Revillagigedo – and the animals always put on a show! We were entertained by a pod of spinner dolphins swimming along the boat – jumping and spinning their hearts out. And we saw whales too!! With so much surface activity just during the crossing, we just couldn’t wait to get in the water!! The next morning we were finally at San Benedicto! Responding to the growing excitement on the boat, the crew got us in the water bright and early for our check out dive in Las Cuevitas – and it was the most awesome check out dive ever! As soon as we dropped in, we spotted a beautiful tiger shark – the perfect way to kick off our shark expedition! Then a pod of bottlenose dolphins came over to say hello to us, followed by mantas! With so much animal action, we never actually even got to the dive site! With everyone on a high from the checkout dive, we then spent the rest of the day at the famous El Boiler – which lived up to its reputation! We did 3 dives there, and spotted more sharks! Galapagos sharks, hammerheads and even a tiger shark! But the star of the show here has got to be the the super friendly giant mantas, with amazing eye to eye encounters, as they came flying round and round the groups to check each diver out. The dolphins also came back to play, and were naughtily trying to lure us down deeper and deeper past our deco limit, grinning cheekily the whole time! The next day, we motored over to El Canon, and had super friendly manta encounters from the get go, with 2 massive black mantas and 1 chevron manta following us around asking to play, like little kids. 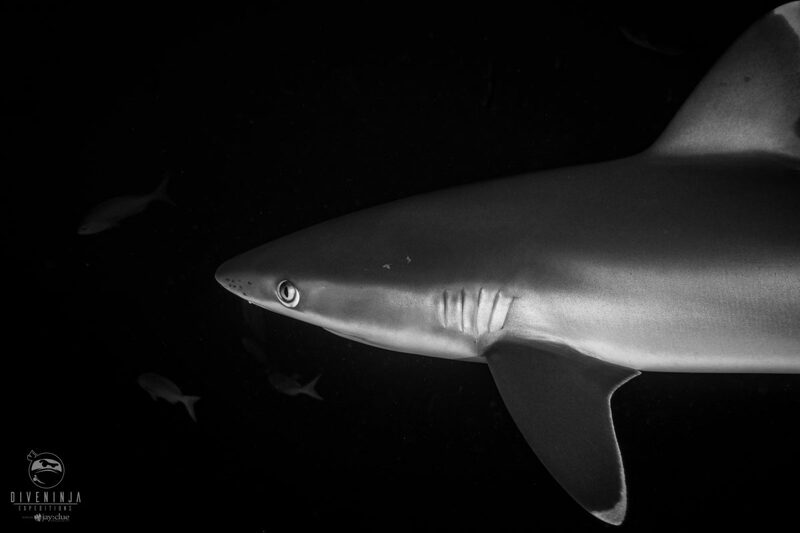 We also spotted lots of circling silvertip sharks, as well as hammerheads, silkies and a large Galapagos shark. During the dives, the group also assisted the scientists in checking and maintaining the receivers, and learnt a lot about shark tagging and tracking, and how important this is for shark conservation. After two awesome days at San Benedicto, we then motored over to Socorro, with 3 dives at Cabo Pearce. 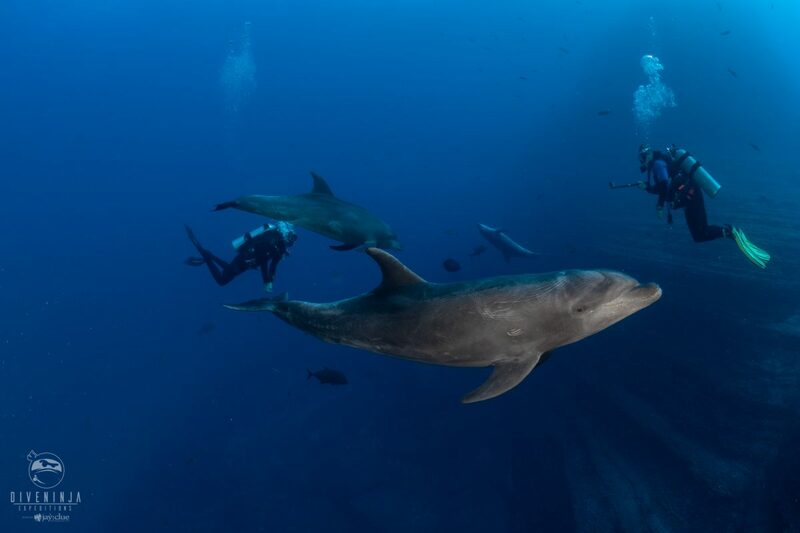 To me, Cabo Pearce always meant one thing – super duper friendly dolphins, and they did not disappoint! We had a pod of about 20 bottlenose dolphins come play with us for most the dives – ducking and diving around the group and begging us to interact with them. They were literally like a group of overgrown over excited puppies asking us to play with them! Totally magical! Even the dive guides said that these were some of the best interactions they have ever experienced, which made us feel extra special and privileged. But as much as the dolphins tried to steal the show, the sharks and mantas weren’t having that! During the dives, when not totally distracted by the dolphins, we had awesome sightings of a big school of hammerheads, a tiger shark, Galapagos sharks, silkies and mantas. At one of the dives, we had a giant manta coming round to hang out with us during our safety stop, almost as if he was trying to figure out what we were doing just bobbing around at 5 metres! We also helped Pete deploy the BRUV system (baited remote underwater video) which allows scientist to study shark behaviour in their natural surroundings – in particular without human presence. After a day of unreal encounters, as the sun set, and after a quick check in with the Navy base, we were off to Roca Partida! Looking out at Roca Partida first thing in the morning was an awesome sight – two sheer peaks rising up from the ocean with big swells all around. Dr Mauricio in particular was really excited to dive Roca Partida, as it usually yields awesome shark encounters. We did 3 dives there – however it was strangely quieter than normal, which just shows that mother nature and the ocean is unpredictable and should never be taken for granted! Nevertheless a quiet day at Roca Partida still meant plenty of action – with big schools of jacks, huge yellowfin tuna darting around hunting, silkies, silvertip sharks, a huge Galagapos shark in the deep, and hammerhead sightings out in the blue. And of course, lots of cuddling stacked white tips sharks in the ledges on the wall! They looked like bundles of kittens snuggled together for a comfy nap! With the winds picking up, we headed back to Socorro for day 5 of diving. Our first dive was at Roca O’Neil, with some pretty cool caves and swim throughs in the sheer volcanic rock face. But, this is Socorro, so of course it’s not just about amazing rock formations! 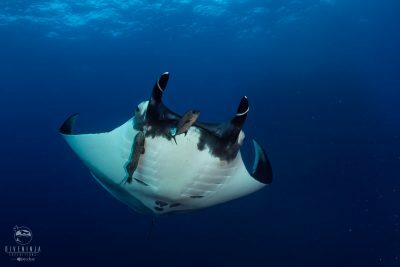 We had 3 friendly mantas tailing us through the whole dive, wanting attention. And then, towards the end of the dive, we had a pod of bottlenose dolphins come flying over and insisting on playing with us! Truly awesome! We then spent the rest of the day diving at Punta Tosca, with more interactions with mantas and dolphins, as well as sightings of huge yellowfin tunas, baby Galapagos sharks, and silkies. One of the other dive groups spent an entire 40 minutes playing with a pod of friendly dolphins and got to see a baby dolphin snuggling and learning from its mom. For our final day of diving, we headed back to San Benedicto, and El Canon. Here, we were massively entertained by 3 giant mantas that approached us at the same time, and played with us and each other – with manta trains, fly bys and fly overs, both with us divers, and each other! They sure looked like they were having fun! We also saw schools of baby silvertips circling round, and a school of whitetip sharks who seem to be out hunting with some moray eels! Then it was off for an excursion in the blue to find those tricky hammerheads, and we found the school a couple of times! Kicking out towards those shadows in a distance until they finally resolved themselves into those super cool looking sharks, and getting close enough to appreciate their unique body shape, and see their muscles ripple as they cut through the water, was a totally awesome way to end a magical expedition. As I sit back now writing this trip report, I’m struck again by what a totally out of this world expedition this was. We had the most amazing interactions with mantas, and dolphins that just kept trying to steal the show. With Mauricio and Pete, we saw pretty much all the shark species that were present at the Revillagigedos, and gained a new appreciation for the work involved in trying to further research and push conservation efforts to protect our sharkie friends. We also had an the most fun and awesome ninja group of guests (diving diving!). And the crew of the Quino were truly awesome, and couldn’t do enough to make sure we had fun (even making pancakes on request!). And so I want to say thank you to all my new shark and euphemism loving diving friends for being such a fun bunch to hang out with. Mauricio and Pete were a fountain of sharkie knowledge and wisdom, and I want to say thank you for their generosity in sharing this with all of us. Thank you to to dive guides Ben (Group B is the best! ), Juan and Celina who were at the top of their game. Kudos too to the crew, especially chef Miguel, who made the yummiest meals a girl could wish for (steak night was a real highlight!). And finally of course thanks to Ninja Jay for puting this together, and pulling off another out of this world trip! Can’t wait for what comes next! Interested in joining Dive Ninjas for next season’s Revillagigedo trip? Or finding out what other Ninja adventures are planned? Send us a message now!